I’ve been wanting to tell you guys this FOREVER, but didn’t want to jinx anything so I decided to wait until after we closed today! We are moving in just a few weeks to our new home! Please excuse the poor photo, but it’s all I had on my phone! The house is in a charming neighborhood just 10 minutes away from our last neighborhood and within walking distance to several of our friends’ homes! I’m just ecstatic about all of it’s original features: great moulding, built ins, hardwood floors, a sweet little sunroom, and a screened in balcony off the master! 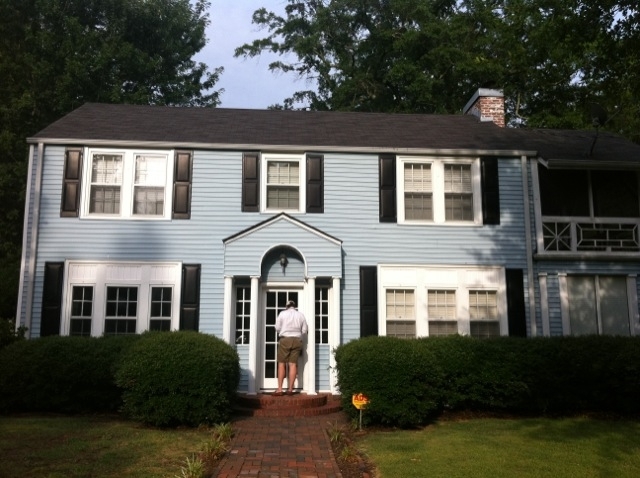 In just a few short days, the blue vinyl siding will be coming down and the original 1925 exterior will be getting a fresh coat of chalky white paint, the hedges will be getting a good trim, and I’ll be going into manic decorating mode! Our goal is to get it restored to it’s historically accurate state so we can get that historic marker back up! (I’m assuming the historical society had a fit when someone decided cotton-candy blue vinyl siding would be a good idea) Lots of before & after photos to come your way soon! Anyway…if you’re looking for me in the next few weeks, try the local fabric store! Toodles! And here’s a pretty picture of Kristin Cavallari because I love her.